Based on their own lab experience and many years of user feedback from advising & assisting our antibody customers in their daily experiments, tebu-bio's Antibody Experts are pleased to bring you this protocol. A tool by scientists, for scientists - this concise overview of the steps to follow, using antibodies & support reagents from renowned, traceable sources, enables you to ensure a high level of reliability and reproducibility in your experiments, to meet new publication requirements. tebu-bio would like to thank Dr Mark Livingstone (Institut Pasteur, Paris), for preparing this protocol. Download the protocol in PDF format here - click on the links at the top of the page to share! Solutions should be pre-prepared with deionized ultrapure water (dH2O) or equivalent. Tris-HCl (1.5M, pH 8.8): Combine 91g Tris base (23483-100) with dH2O to a total volume of 400mL. Adjust pH to 8.8 with NaOH and then add dH2O to a final volume of 500mL. 10% APS (Ammonium Persulfate): Combine dH2O with 1g APS (1708-0100) to 10mL total. Aliquot in 1.5mL and store at -20°C. Tris-HCl (0.5M, pH 6.8): Combine 30g Tris base (23483-100) with dH2O to a total volume of 400mL. Adjust pH to 6.8 with NaOH and then add dH2O to a final volume of 500mL. 2X SDS Sample Buffer with DTT (1mL): Add 50ul freshly prepared or thawed 1M DTT to 1mL 2X SDS Sample Buffer (MB-018). 1X SDS-PAGE Running Buffer (1L): Combine 900mL dH2O, 100mL 10X Tris-Glycine Buffer (24088-500), and 10mL SDS 10% (MB-015). 1X SDS-PAGE Transfer Buffer (1L): Combine 700mL dH2O, 100mL 10X Tris-Glycine Buffer (24088-500), and 200mL ethanol (100%). For very large proteins, it is sometimes recommended to reduce ethanol content to 10% or adding SDS (<0.05%). 1X PBST (Phosphate Buffered Saline with 0.1% Tween 20): Add 1mL Tween 20 (T20) to 1L of 1X PBS. Blocking Buffer (100mL): Combine 85mL dH2O, 10mL of 10X PBS/NaN3 (MB-011), 5g Western-blot grade Non-Fat Milk Powder (875014-200G), 100uL Tween 20 (T20), and mix well. Store at 4°C. Primary Antibody Dilution Buffer (100mL): Combine 85mL dH2O, 10mL PBS/NaN3 (MB-011), 5g BSA (1501-0100) and mix well. Store at 4°C. Secondary Antibody Dilution Buffer (100mL): Dissolve 5g skim milk powder (875015-200G), in 95mL 1X PBST and mix well. Store at 4°C. These secondary antibodies are provided in solution. When purchasing lyophilized antibodies, resuspend dried antibodies in 1X secondary antibody storage buffer (For 10mL mix 4.5mL dH2O, 100ul 1M HEPES (MB-062-0100), 300ul 5M NaCl (MB-047), 20mg BSA (1501-0100), and 5mL glycerol. Store aliquots at -20°C. Remove medium and wash cells two times with cold 1X PBS, aspirating residual buffer. Add 1X RIPA Lysis Buffer (MB-030-0050) (250 µl) to each 10cm dish. Immediately scrape the cells off the plate and transfer the extract to a microcentrifuge tube. Keep on ice. Sonicate for 10–15 sec using a probe sonicator to shear DNA. Alternatively, lysates can be microcentrifuged at full speed 4°C and supernatants collected, however some DNA associated proteins may be discarded. Quantify total protein content in the lysate using Total Protein Determination Kit (M1585), according to the manufacturer's instructions. Combine 20ul 2X SDS Sample Buffer, 20ug of total protein (volume based on Total Protein Determination), and sufficient 1X RIPA Lysis Buffer to yield a total volume of 40ul. Heat sample to 95–100°C for 5 min, microcentrifuge briefly, and store at -20°C until use. In a 15mL plastic tube, combine acrylamide/bisacrylamide solution and dH2O volumes as indicated in Table 1 according to the molecular weight of the protein being studied. Add 2.5mL Tris-HCl (1.5M, pH 8.8), 100ul SDS 10% (MB-015), 80uL 10% APS, and 4uL TEMED (1718-0030). Mix the solution well and pipette/pour the solution immediately between the two plates (plastic or glass) as recommended by the SDS-PAGE gel apparatus manufacturer. Fill the chamber up until you reach a point that will be 1cm below the bottom of the gel comb when it is added in the next step. Overlay the gel with 100% ethanol. After the separating gel polymerizes (usually 15 minutes), pour off the ethanol. Table1 - Volumes of acrylamide/bisacrylamide solution and dH2O required to produce a polyacrylamide gel. * For optimal results use acryl./bisacryl. 37.5:1 (24165-100) for 12% and 15% gels and use acryl./bisacryl. 29:1 (24169-100) for 10% and 7.5% gels. Prepare an SDS-PAGE mini stacking gel: In a 15mL plastic tube, combine 500uL acryl./bisacryl. 29:1 (24169-100), 2.2mL dH2O, 940ul Tris-HCl (0.5M, pH 6.8), 38uL SDS 10% (MB-015), 38uL 10% APS, and 4uL TEMED (1718-0030). Mix the solution well and pipette/pour immediately on top of the separating gel. Add the gel comb. After the stacking gel polymerizes completely, remove the gel comb. Load the polyacrylamide gel into the SDS-PAGE gel apparatus according to manufacturer's specifications and prefill the required chambers including gel wells with 1X SDS-PAGE Running Buffer. Load 5uL Multicolor Protein Marker (TM0005) into the first lane of the SDS-PAGE mini gel using a gel loading tip. Warm cell lysates from step 5 to room temperature, centrifuge briefly, and load 20-30uL of sample per well. Run gel until the dye front reaches the bottom of the gel. Prepare transfer using a wet/tank blotting system. Wash transfer apparatus and sponges well with water immediately prior to use. Add 1X SDS-PAGE Transfer Buffer to the tank containing sponges. 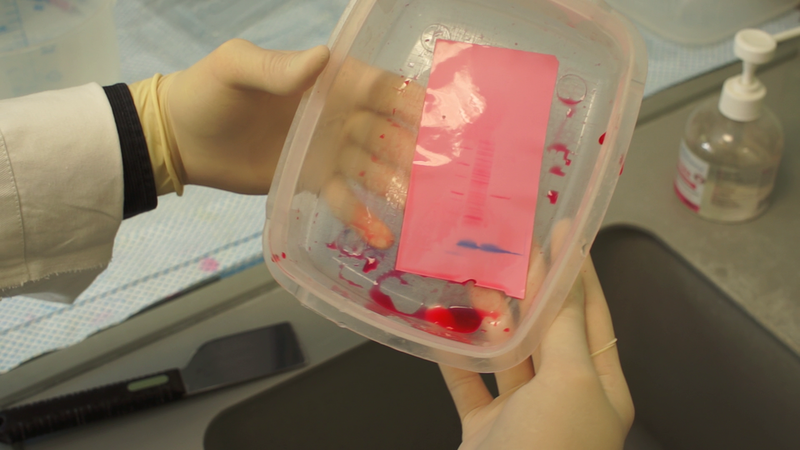 Using scissors, cut nitrocellulose transfer membranes and "Whatman-style" blotting paper to slightly larger than the size of the SDS-PAGE gel. Soak nitrocellulose membranes and blotting paper in 1X SDS-PAGE Transfer Buffer. Disassemble the SDS-PAGE gel, and prepare stacks in the transfer cassette with the order: white side of cassette/sponge/blotting paper/nitrocellulose membrane/gel/blotting paper/sponge/black side of cassette. A 10mL pipette should be used to gently roll out bubbles after the last blotting paper is laid on the stack. Close and place the cassette in the transfer apparatus making certain the positive (white/red) vs. negative (black) orientation is consistent. Add a stir bar to the tank, close the lid, and transfer at 4°C with stirring. A constant current of 300mA for 2 hours is generally ideal. After transfer is complete, move the nitrocellulose membrane to a glass or plastic dish. Note: a pipette tip box lid is useful for this purpose. Optional: Ponceau S staining protocol. Prepare Ponceau S Staining Solution by combining 10mL dH2O, 0.3mL glacial acetic acid, 33mg Ponceau S, mixing well and then bringing the total volume to 30mL with dH2O. Wash nitrocellulose membrane two times with dH2O and then stain the nitrocellulose membrane with Ponceau S Staining Solution with gentle agitation. Remove the Ponceau S Staining Solution and wash the membrane with dH2O at least three times and visualize cellular proteins. At this point, the membrane can be evaluated to determine if equivalent amounts of protein were loaded in each lane. You may wish to photograph or scan the stained membrane or to cut the membrane horizontally so that you can use one primary antibody on the top of the membrane and another on the bottom of the membrane. Wash the membrane with 1X PBST. Incubate the membrane in 10mL of Blocking Buffer for one hour at room temperature with gentle agitation or rocking. Incubate the membrane in 10mL Primary Antibody Dilution Buffer with the primary antibody added at the appropriate dilution (e.g. 10uL for a 1:1000 dilution), overnight at 4°C with gentle shaking/rocking, or 1 hour at room temperature. Collect diluted antibody and save for future use at 4°C. Wash the membrane 3 times with 10mL PBST. Incubate the membrane in 10mL of Secondary Antibody Dilution Buffer with the correct secondary antibody (e.g. anti-rabbit HRP if a rabbit primary antibody was used) at the manufacturer's recommended dilution, for one hour at room temperature. Discard the used secondary antibody and buffer and wash the nitrocellulose membrane 3-5 times with PBST for 5 minutes each wash with gentle agitation. Note: further washing at this step with vigorous agitation often improves the signal-to-noise ratio of the western blot. Prepare ECL (enhanced chemiluminescence) Substrate (10mL): Mix 5mL each of Reagents A and B (SL100309). Following the final PBST wash, discard the PBST and incubate the membrane in 10mL ECL Substrate for 1 minute with gentle agitation. Pick up the membrane with forceps, touch the corner to a paper towel, and place the membrane between two pieces of clear plastic (options include: transparencies for an overhead projector, saran wrap, a thin plastic bag), and expose the membrane to film in a dark room with developer. The videos and pictures were taken in our own laboratory - special thanks to Aurélien Pitois (tebu-bio recombinant Protein Production Technician) who performed the WB. Images taken & sequences filmed by François Tissandier (IT Manager). According to your own experimental conditions and requirements, you may wish to review and adapt the protocol where necessary.